Special Thanks to Cathay Pacific Airways and Captain Ray Corstin. I experienced the famous landing course of Hong Kong Kaitak airport, that is commonly known as "Hong Kong Curve", in the flight deck of Cathey Pacific Airways flight CX250, from London to Hong Kong. I would like to present the state of affairs in the flight deck. After dinner service I took out the flight record as usual and I asked a steward to make an entry. Usually, every steward brings it back to me in about thirty minutes, but then I would not get an answer for some time yet and I had a good sleep till breakfast service. When I saw the navigation screen, we already flew over Myanmer. After breakfast the steward came to my place again and said "Mr. Hirai, our captain Corstin invites you to the flight deck." I thought it was a unique opportunity and I had no hesitation about visiting. 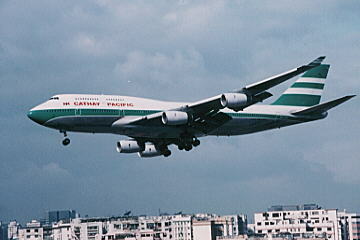 Our ship was Boeing 747-467 (VR-HOV), the standard aircraft used on long haul flights. The steward took me to the flight deck and captain and co-pilot welcomed me. "Is that your flight log book?. Be at home here till we arrive to Hong Kong." I was very surprised because I thought I could stay flight deck only for a little while. 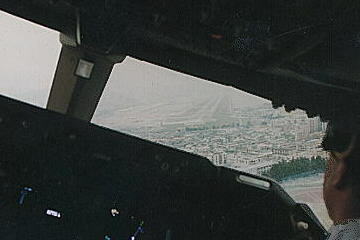 I sat on the subseat behind co-pilot, and looked around the flight deck. The display of new 747 seened to be more conspicious and straight forward than old one. But the altimeter and the direction seemed to attach the analog meter. "There is not a Flight Engineer, is it ?" I asked intentionally. Then he pointed out the display in the center and answered me with a smile, "Flight Engineer is here." He said FEs took up different employment because there were few plane that needs FE at the present time. Captain Corstin said he worked in Boeing 747-200(The previous type of 747 family) for ten years and then he switched to Boeing 747-400. After that he explained the present condition of the engines, the rest of fuel, the altitude, today's approach course, and so on by using the display and the flight chart. Our prearrangement approach course was the "Hong Kong Curve". I thought maybe it was a last chance for me to experience the "Hong Kong Curve" because Hong Kong's new airport, Chek Lap Kock, would be opened in a few years. So I could not help hiding my joy because I could experience the last opportunity in the flight deck. We continued to fly on keeping 37,300 feet. After the general explanation was finished, then he said to me, "Put on the headset." The conversation that I usually heard by using the airband receiver at the airport could be heard in the plane that I took and pilot operated as directed from the tower just in front of me. This experiment was nothing but strong impression to me as one of the airline fans. A Singaporean chief purser called on us at the flight deck. She asked me, "How do you feel?" "It is great." I answered. "Is she nice Mamasan, isn't it?" Captain joked with me. Immediately the purser answered "I'm not Mamasan" in Japanese." I thought if we were in an airplane accident, analysist would be dumbfounded by hearing the voice recorder that recorded their jokes and my poor English. In the meantime, the plane had started to make a landing. The pilot lowered the flaps, confirmed the landing gear and indicate seatbelt sign in a cabin. We approached over the Chek Lap Kok Hong Kong new airport while he changed the direction and altitude as directed from the tower. 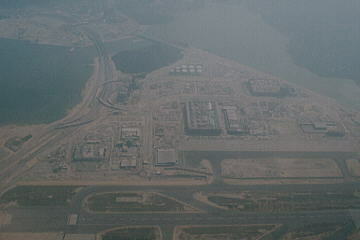 It was a little hazy so I could not see clearly but new airport was constructed mostly. 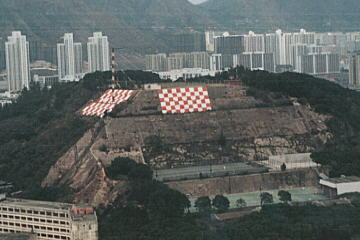 The ship descended, we can see landing marker(painted red and white) on the mountain near Kaitak airport. Closer and closer to the marker, turned to right greatly. Soon we landed to the runway and reversed the engines to reduce speed. After landing, I heard taxiway and spot announcement from my headset, and the ship was taxing as the announcement. Continue taxing to spot 8, the captain stopped engines and I finished 12 hours long haul flight to Hong Kong. I never forget this wonderful flight! !